Infrared thermometer market is expanding at a broader scale in the regions demanding expert healthcare services. The temperature related issues are prevalent in the geriatric population. Japan has one of the fast-growing aging populations in the world, which makes it an attractive market for infrared thermometers. Whereas, U.S. is another important region for the market, as it stands leading in terms of healthcare spending. In the U.S., home care solutions comprise 10% of the national health expenditure and is expected to increase in the coming years. 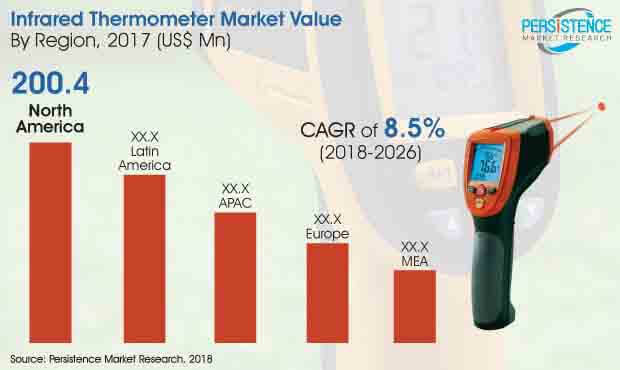 The regional analysis of infrared thermometer market is depicted in the research report by Persistence Market Research, which includes North America, Latin America, Europe, Asia Pacific (APAC) and Middle East and Africa (MEA) as the key regional segments. Among these regions, North America is expected to hold the highest market value of over US$ 400 Mn by the end of 2026. However, APAC is expected to register fastest growth rate of 9.2% during the forecast period. Australia and New Zealand collectively holds the maximum share in Asia Pacific infrared thermometer. The demand is majorly driven by the growing awareness among people about the infrared thermometers and also a rise in number of veterinary infrared thermometer manufacturers. The ease of use and affordability are the main driving factors which are pulling the demand of infrared thermometers. Since, the training is easier and the thermometers are easier to use and do not need as much work to set them correctly, the demand of infrared thermometer is witnessed globally. Moreover, the demand for quick and safer test results is also a driving factor allied with increase in adoption rate of infrared thermometer. The region has also witnessed an increase in awareness regarding infrared thermometer, which is due to the rise in infectious diseases. Rise in prevalence of infectious diseases as there is chance of spreading disease from contact thermometer and also demand for the newborns as children cannot hold the contact thermometer is increasing demand of Infrared Thermometers. The adoption rate of infrared thermometer in Middle East and Africa is less due to less reach of prominent players, and high cost of device. Moreover, less disposable income and less awareness is also playing a key role which hampers the growth of this market. Most of the countries in this region are still inclined towards digital thermometers, rather technologically advanced infrared thermometer. However, the increasing number of patient pool may come up as an opportunity for key players in infrared thermometer market to expand their reach in the region. It can also be termed as an untapped region for market players, which they can make use of in the upcoming years.